Slow Cooker Cheddar Corn - this stuff is AMAZING!! Just dump everything in the slow cooker and let it work its magic! 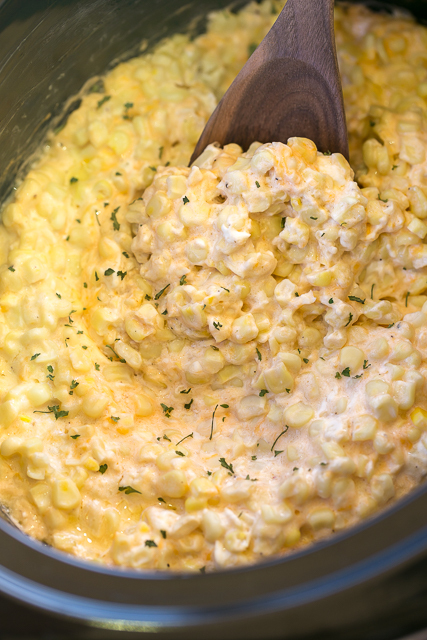 Frozen corn, cream cheese, cheddar cheese, butter, heavy cream, salt and pepper. Great side dish for a potluck! There is never any left! Such an easy side dish recipe!! Corn is one of my all-time favorite veggies. It could only be that much better when you add some yummy cheddar cheese and cream cheese to the mix. YUM! This Slow Cooker Cheddar Corn was a big hit at our house. I loved that I could just dump everything in the slow cooker and let it work its magic. So easy! This recipe makes a lot of corn. It would be perfect for the upcoming Easter holiday or a summer cookout. 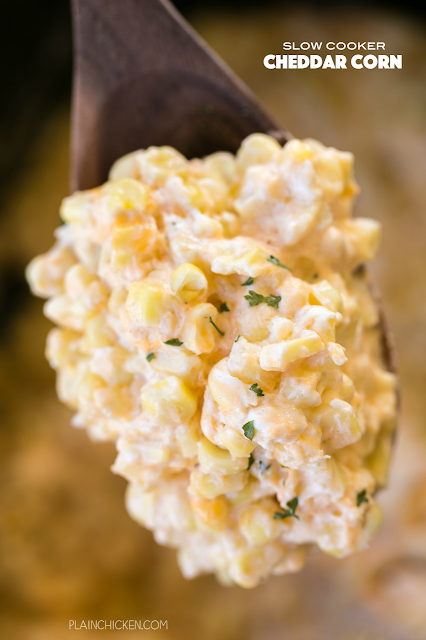 We loved this Slow Cooker Cheddar Corn. It was seriously one of the best corn dishes we've ever eaten. I mean it couldn't be bad with cheddar, cream cheese and heavy cream. 🙀 This is definitely not health food, but it is absolutely delicious food!! could this stay on low for more time? for me, crockpot foods are only convenient for work days, and I'm gone for almost 10 hours. would this be ok sitting for that long? I do think it would be fine. My slow cooker will switch to warm after you set the time. It's even better with bacon and green onions tossed on at the finish! Yum!! I'll try that next time. Can you tell me what type of corn you used. Was it kernel corn in the bag or the cream corn that comes in the tubes? I recently made a corn casserole recipe from another site and it was really dry. On looking back, I think I used a different type of corn than they did because theirs looked creamy and delicious. Thanks in advance! I used frozen kernels, not the creamed corn in the tube. I like to buy the Silver Queen Corn Kernels, if you can't find the Silver Queen regular yellow kernels are fine. Thank you so much for the super fast response! I can't wait to try this recipe! What grilled meat is this best served? Could this be easily made into a smaller batch? Have you tried making this with fresh corn? Have you tried this recipe with fresh corn? Excellent side dish. Everyone at work loved it and wanted the recipe. Made this today for a b-day potluck at work. Everyone loved the dish and wanted the recipe. Thank you for a wonderful side dish. that is correct - enjoy! Has anyone cooked it on high or in the oven? hi! I want to bring this to my parent's for easter. does it warm up well in the microwave? Have you ever doubled the recipe for bigger crowds? I doubled the recipe ant it worked out perfect. I also added some chopped up bacon to the mixture at the end and browned some panko bread crumbs in butter and spread the browned breadcrumbs on top when i served it. Did you need to cook it longer since double the recipe? Did you have to increase cooking time since you doubled the recipe? Any ideas on putting this in a casserole dish with a topping once finished cooking? I made this dish about a week ago, has anyone tried to freeze it and then reheat in the crockpot? I have a ton of canned corn I need to use do you think I could swing this using canned corn? I don't see why that wouldn't work. You may need to reduce the cooking time a bit. I'm making this for a potluck at work next week. How many people does this serve? Can this be made in the oven instead of a crock pot? Has anyone tried it in the oven? If so, how long in the oven and temp? Do you have to use frozen corn? Would canned corn work? You should be able to use canned corn. It just might not take as long to cook. I would love to know if anyone successfully froze this. I would love to be able to make portions and freeze it in foodsaver bags. This way I always have sides available. Thank you. Would you be able to make this dish in the oven? It sounds delicious!